Note: I have updated this recipe since originally posting it. I’ve added sausage as an optional ingredient, reduced the amount of olive oil, and improved the cooking method slightly. 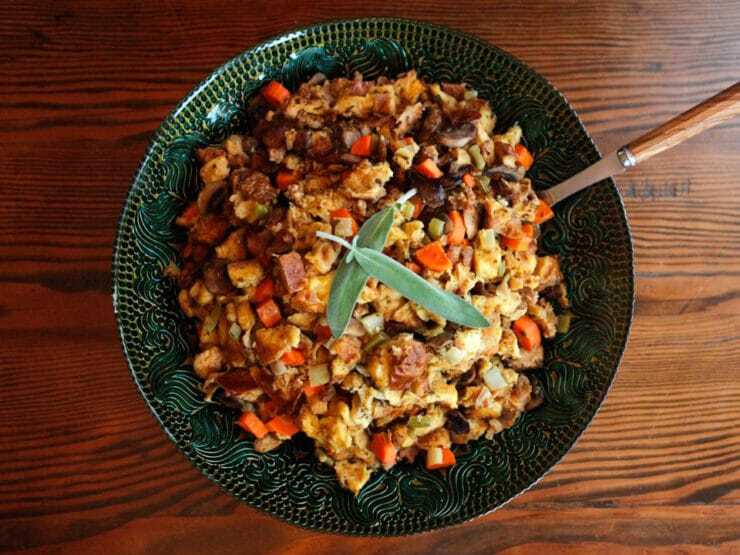 I highly recommend the sausage, which gives the stuffing a wonderful savory flavor– but if you’d prefer to keep it vegetarian, it’s still a great stuffing without it. Some people say that it should be called dressing unless it’s cooked inside the bird. But in our family, it’s always been called stuffing, so that’s what I call it. I don’t actually stuff my turkey, though. I follow the Alton Brown school of thought; he stuffs the turkey with aromatics, because he feels that stuffing draws moisture out of the bird (making the meat drier). But everybody expects a little stuffing with their Thanksgiving meal, whether you’re stuffing a turkey or not, so I like to prepare a batch in the slow cooker. This frees up oven space and makes the holiday prep just a little less manic. Knowing that the stuffing is slowly cooking, filling the air with delicious herby aroma, gives me one less thing to worry about. 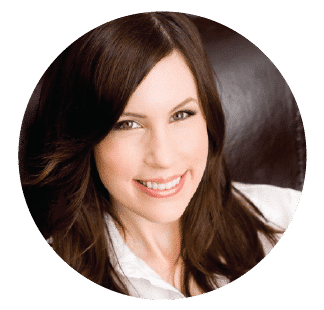 I make my Thanksgiving stuffing with the ultimate Jewish bread– challah! When cubed and toasted, this eggy bread becomes the perfect sponge for savory chicken broth and herbs. This Challah Slow Cooker Stuffing doesn’t need butter or margarine (and those unnecessary calories) to taste great. It has plenty of flavor and mouth-watering aroma from fresh herbs, a good quality chicken broth, and sautéed vegetables. 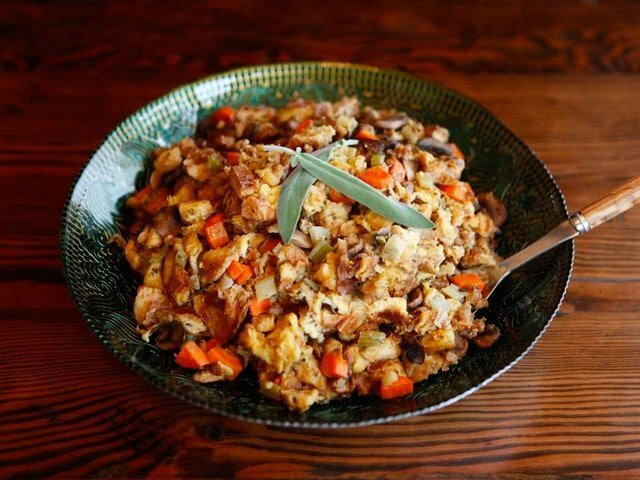 Think of this stuffing recipe as a base; you can add unique touches to make it your own. Some people integrate different spices, dried cranberries or roasted turkey giblets. This year I’m thinking about adding some kosher Merguez sausage to mine for a spicy kick! Tip: If you want an extra savory flavor in the stuffing, omit the 1 tsp salt added with the broth. Instead, dissolve 1 tsp of chicken consomme powder (or a bouillon cube) into the broth before adding to the challah cubes. Taste the stuffing and season with additional salt at the end of cooking, if desired– chicken powder can be quite salty, so be sure to taste and season with care. So what do you call it… stuffing? Dressing? Or both? 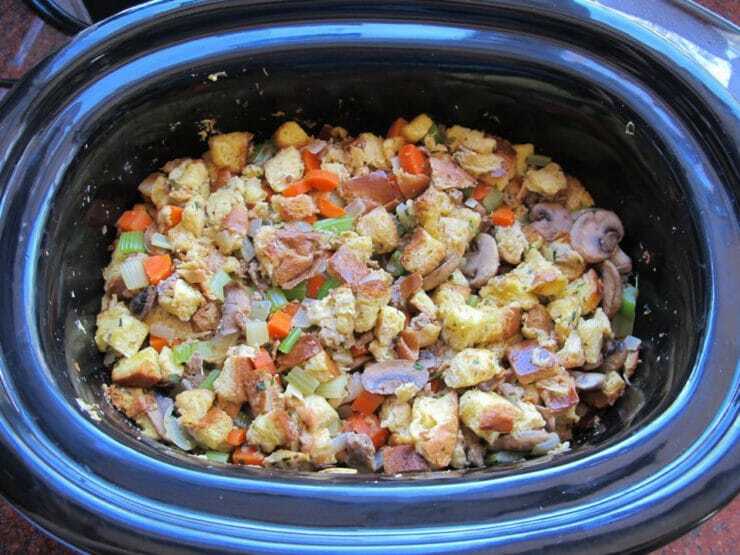 Make delicious kosher holiday stuffing or dressing in your slow cooker from challah, herbs, mushrooms & vegetables. Thanksgiving, Holiday recipe. Preheat the oven to 350 degrees F. Cut the challah into ½ inch cubes. Spread the cubes out across two baking sheets. Place the trays in the oven for about 12 minutes, switching trays on racks halfway through cooking. The challah cubes should be toasted and slightly golden. Remove from oven and allow to cool. Heat 2 tbsp of olive oil in a large sauté pan over medium high. Add sausage to the pan and cook until browned. Transfer to a bowl using a slotted spoon and reserve for later. If you are not using sausage, see note at the end of this recipe. 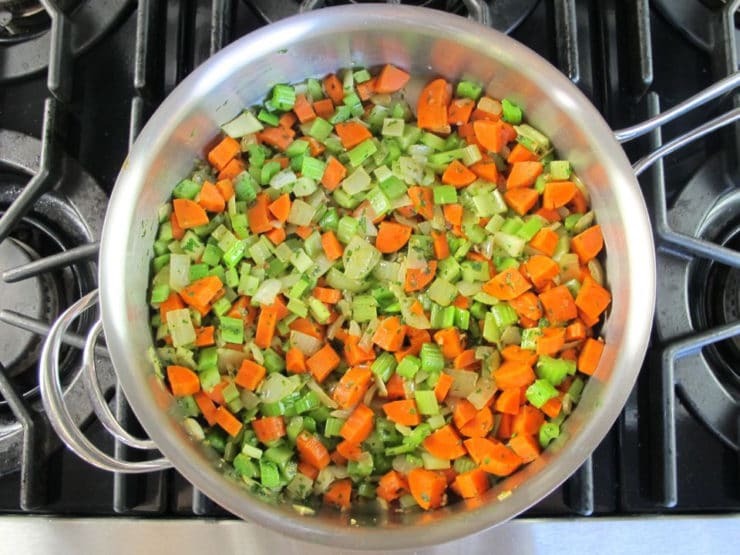 Add the onions, carrots and celery to the same pan and sauté for 5-6 minutes until softened and fragrant. Add garlic and sauté for an additional 2 minutes. 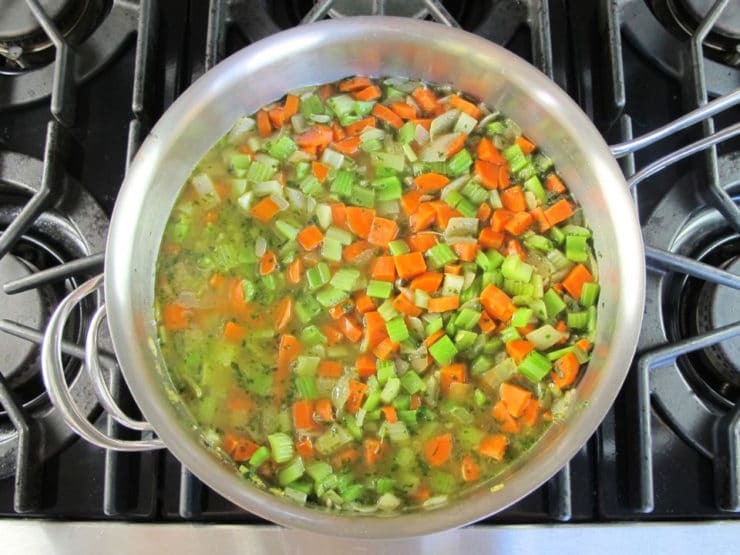 Pour 2 ½ cups of chicken broth into the pan along with 1 tsp of salt and ½ tsp of black pepper. Remove from heat. Reserve remaining chicken broth. Heat the remaining 2 tbsp of olive oil in a clean skillet over medium high heat. Add sliced mushrooms to the skillet. Sauté for 10 minutes, until the mushrooms begin to brown and shrink in size. Remove from heat. 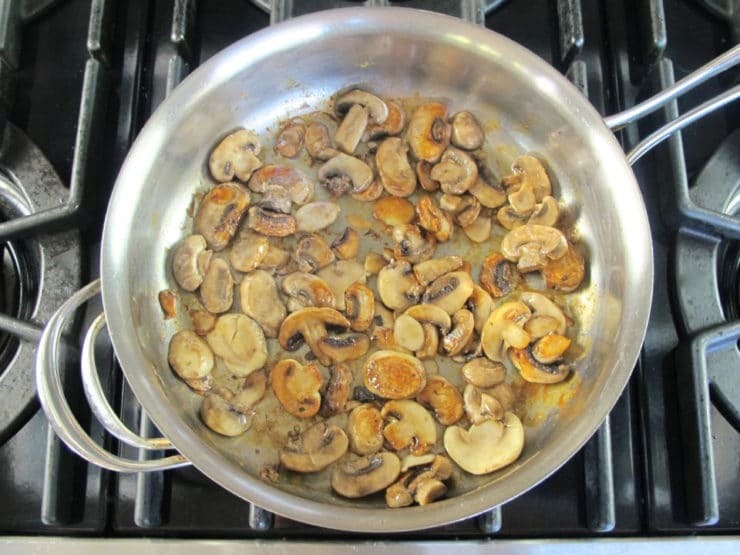 You may need to cook the mushrooms in two batches depending on the size of your skillet. 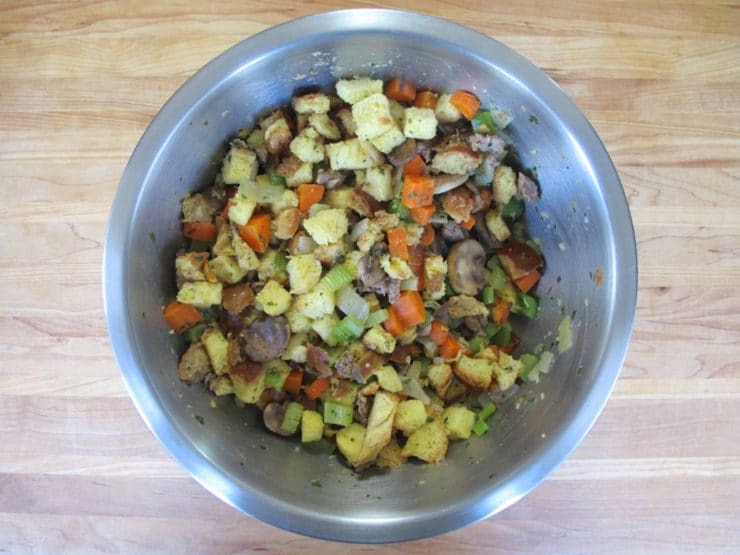 In a very large mixing bowl, combine challah cubes, sausage, vegetable/chicken broth mixture, mushrooms and herbs. Stir to blend all ingredients, making sure the challah cubes are evenly moistened. Add the beaten eggs to the mixture and stir until they are fully incorporated into the stuffing. The mixture may seem dry now, but wait to add more broth until it’s had a chance to cook—the liquid will slowly be absorbed by the bread. Spray the slow cooker with nonstick cooking spray; then pour in the challah mixture. Set slow cooker on high heat and cover the pot. Cook for 30 minutes. 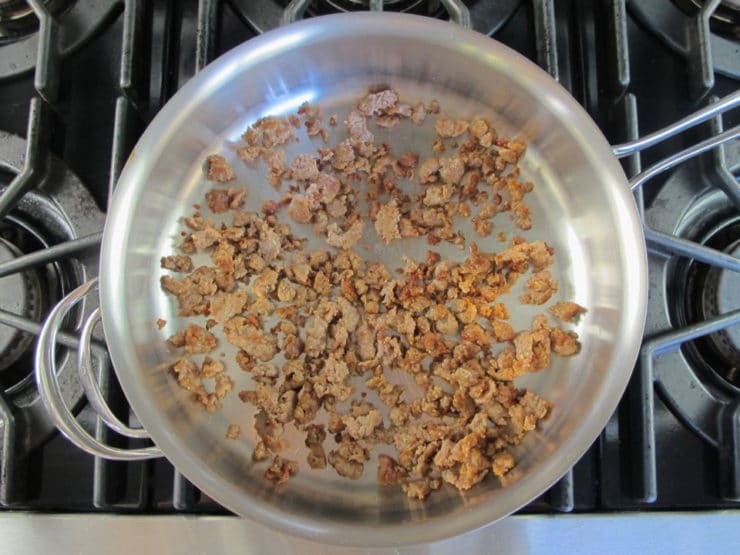 Remove the cover and stir to redistribute the liquid throughout the stuffing, then check the stuffing for dryness. If it still seems dry, drizzle a little more broth over the top of the stuffing and stir again. Return the lid and reduce heat to low. Let cook on low for 4 hours, checking and stirring every hour to make sure the stuffing isn’t too dry. If it is, add more broth—carefully, as it can easily go from the right texture to overly wet and mushy. After 4 hours, stir, taste, and add more salt or pepper, if desired. Switch to warm setting until ready to serve. Variation: If you prefer to make your stuffing without sausage, skip that step and begin by first sautéing the onions, carrots and celery in 6 tbsp of olive oil, then continue the recipe as written, omitting the sausage. This looks so good. Do you think it would be OK to prepare ahead of time, the day before and put in the crockpot the day of? Hi Lisa, I wouldn’t make all of it ahead due to the fact that eggs are added to the warm mixture, which can cause a food safety concern if not cooked right away. 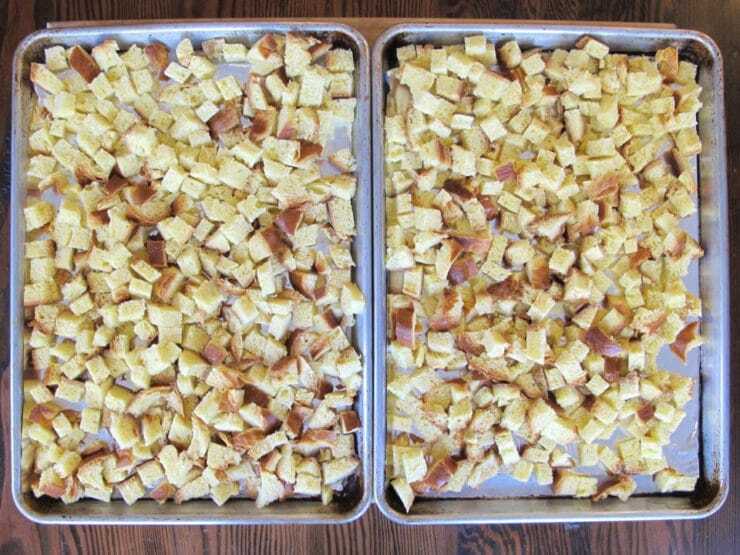 If you want to make some elements of the stuffing a day ahead, toast the challah cubes and chop up your veggies in advance. This will cut the prep time down to only 15-20 minutes. I’m definitely trying this! Thanks for the recipe! Stuffing in a bird, always bread based, dressing cooked outside of bird, cornbread based. We always had both, growing up in Texas. dressing! We make it with cornbread. In our house, it’s stuffing when cooked inside the bird and dressing when cooked away from the bird. You bad bad girl. I say that in a good way. I love dressing. It is stuffing if it is baked inside the bird, and dressing if baked separately. In my family it’s stuffing, no matter where it is cooked. We love Challah, and I will bet that it makes a GREAT stuffing. Can’t wait to try this! I’m gonna try this..I’ll do a trial run. With the callah, I prefer to user my toaster over rather than my regular oven, besides my turkey will be in the oven. With a toaster over the bread will toast a few minutes faster. The second thing here is I like to use turkey stock/ broth in my stuffing. Alexis, just a quick note to let you know that if you want to, you can toast the bread cubes up to a few days in advance. We called it dressing, but out here they say, stuffing! I’m going to try that apple challah stuffing thanksgivvakuh recipe! I made your pumpkin challah yesterday and it’s so delicious! Could I use that in the stuffing? Would herbs would you suggest? Hi Barbara, I’m not sure about the pumpkin challah– the spices and slight sweetness might clash a bit with the savory broth and herbs here. That said, it might be excellent! I’m just not sure and it’s difficult to imagine all of those various flavors together. If you try it will you please report back and let us know how it goes? We call it stuffing, but like you we don’t stuff the bird. My aunt has made challah stuffing for my entire life-I always skip the turkey and just eat stuffing! And, like you, my Dad (who always cooked the turkey) never “stuffed” the turkey. Thanks for sharing this holiday recipe —sounds delish’. It’s not stuffing unless it’s stuffed in the bird. Stuffing even though we don’t put it in the bird. Dressing as it really shouldn’t be cooked stuffed in a bird. I love using my crockpots (yes, more than one) for Thanksgiving. I have several just for the holidays. Dressing stays moist and delicious in a crock pot and mashed potatos made the day before re-heat beautifully in a crockpot. Green bean casserole cooks really well too (I use one with a removable crock to pop in the oven to crisp up the onion rings everyone loves on green bean casserole during the last few minutes while gravy is cooking and the turkey is resting). Using crock pots really helps take the pressure off my oven and stove top when making large holiday meals for 15-20 people or more. They keep large quantities of holiday food hot and moist! Dressing, it’s always dressing my family. Stuffing if it was cooked in the turkey; dressing if baked in a pan. Stuffing or dressing, who cares? A bread product by any other name is still delicious! I never though of using Challah for stuffing, even though it makes the BEST French toast in the world…Thanks! Dressing is made with corn bread. Stuffing made with bread crumbs (usually white bread). That looks so good. I’d love a big bowlful right now. Can you do this in the oven? If so, what temperature? We call it stuffing and this looks amazing!! I love my slow cooker. Does a great job. We called it stuffing when I was growing up. What kind of sausage do recommend? Love the idea of using the crockpot because my space is limited! Since I am gluten free this year I will switch off to rice and veggies will be squash and sweet potatoes with onion. Love mushrooms and adding dried cranberries. Can’t wait to try this. I am keeping giblets on the side for guests to add to their stuffing. I must insist that if it isn’t stuffed into the bird, it is dressing! This looks awesome! Stuffing if cooked within, dressing if cooked outside do boid. It’s only stuffing if you put it into the bird. Otherwise, it’s dressing, as in side-dressing. Yum going to make this! “Filling” in Amish country, near Lancaster, PA! I’ve never heard that one Chris! How cool! That’s a new one on me too, Chris. I grew up in MI and, as I said, it was stuffing there. Inside of turkey is stuffing and made on the side is dressing . stuffing when put into the turkey, dressing when cooked separately from the turkey. Ok, you mentioned Alton browns turkey. So, do you brine your kosher turkey? This seems like overkill, but I’d love your opinion… Thanks! Simple it’s only stuffing if you put it in the bird. Dressing if done any other way. Dressing. My mother used to stuff but we stopped doing that when there was a lot of food poisoning blamed on turkey that was stuffed. My mother used to stuff a hen and boil it. She called that dressing. Sara I also find that stuffing the bird seems to make it drier. I stopped doing it a long time ago because of that as well as the food safety concerns, although a bird can be safely stuffed with proper temp measurement. I used to stuff the bird, but now I cook it separately. You have to roast a stuffed turkey longer in order to achieve the safe internal temperature~ as a result, you will end up with a drier, less appetizing bird! I have purchased turkey wings and laid them on top of the dressing so they are flavored with the drippings and are safe! It’s dressing for us. My mom had been doing a crock pot version for a couple of years. So moist and good!! Slight hijack here, I am eating falafel from your recipe. It is soooooo good!!!! I love that kind of hijack Renee! 😉 Enjoy the falafel! Stuffing if cooked inside the bird, Dressing if baked outside. Me too Gilly! I know it probably doesn’t make much sense, but my family calls it stuffing and we’ve never stuffed the bird. Funny how different families use different words for the same concept. I really want to try this, but there will be around 15 people at my home for T’giving. Can this be doubled? This sounds amazing! Do you think it could tolerate being in the slowcooker overnight (for Shabbat day)? Hi Sonya! I’ve never tried it overnight, but it may get dry. If you try it, keep the heat low, and if your Shabbat rules allow, keep broth on hand and check periodically for dryness– add broth as needed. If you try it let me know how it goes! This was delicious and a crowd favourite! Thanks! I have been making stuffing/dressing with Challah for years….and with your Challah recipe since you shared it. Thanks for the confirmation that it can be done in the slow cooker! 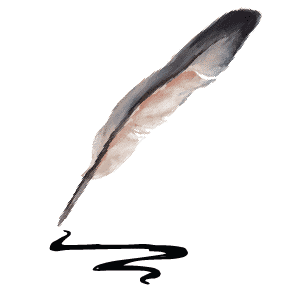 It will absolutely be done like that here tomorrow….and for years to come! I add dried cranberries and walnuts to ours. Leigh, the cranberries sounds like a great addition – how much did you add? I save all my left over challah in the freezer and make a stuffing loaf from it once I have about 7 cups of cubed bread. Never thought to make it in the slow cooker. Do you think this recipe would work the same with matza? My family prefers it over the bread stuffing. Tori this is amazing. 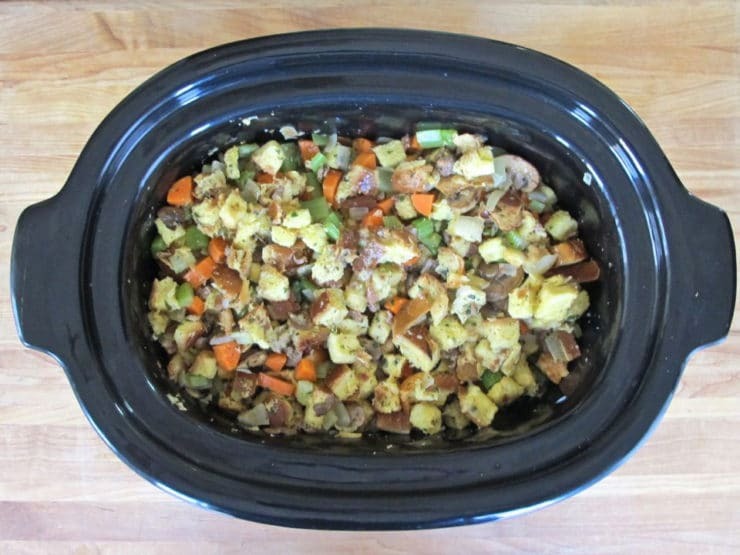 I have never thought of using my crock pot for stuffing. I am totally going to try this out. We call it stuffing. I don’t stuff as that would require my food to touch and you know how I feel about that. I am really enjoying your Thanksgiving posts. We had our Canadian one last month but I think I should give in and cook one this weekend again. I’ve always called it stuffing, too (even though my is never “stuffed” either). Wow — this recipe looks simply divine! Love that it cooks slowly, filling your home with Thanksgiving flavors! Tori, I’m SO happy to see this recipe because I just made your Challah bread recipe, which turned out fantastic! (My first time braiding a bread and I had success with the six strand loaf!) I was thinking that the Challah would make a great stuffing bread so I cubed it and froze half of it. What great timing for this recipe, I’m going to use it for Thanksgiving! It is a brilliant idea to use a slow cooker to free up the oven for other dishes! 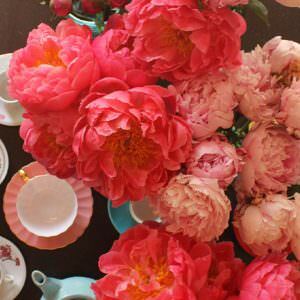 Thank you, I always enjoy your site and recipes! Challah goes with anything! 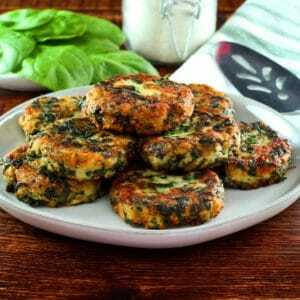 I like the idea of using more herbs and cutting down or eliminating butter. I bet being able to cook in a slow cooker eases the workload on Thanksgiving.